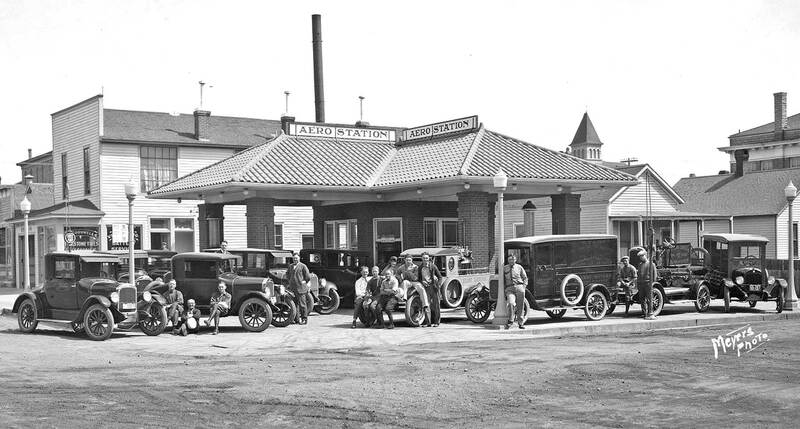 Today’s feature image dated 1925 contains an assortment of “Star Cars” on the left-hand side of the picture and the “Star Caravan” on the right-hand side parked at an “Aero Station” located in Rawlins, Wyoming at Sixth and Buffalo Streets. It appears that the “Caravan” met up with a “Star” Dealer in the City for some sort of a promotion. 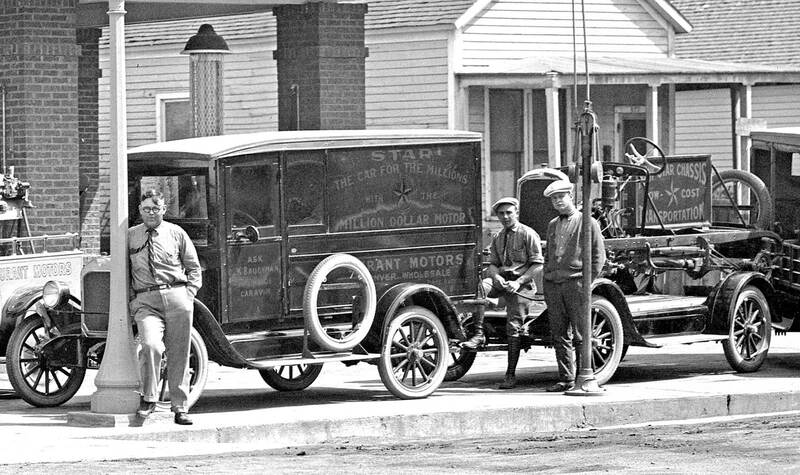 Vehicles in the “Caravan” left to right include: a “Star” pickup truck carrying a display engine, a panel truck towing two display chassis’ and a station wagon. 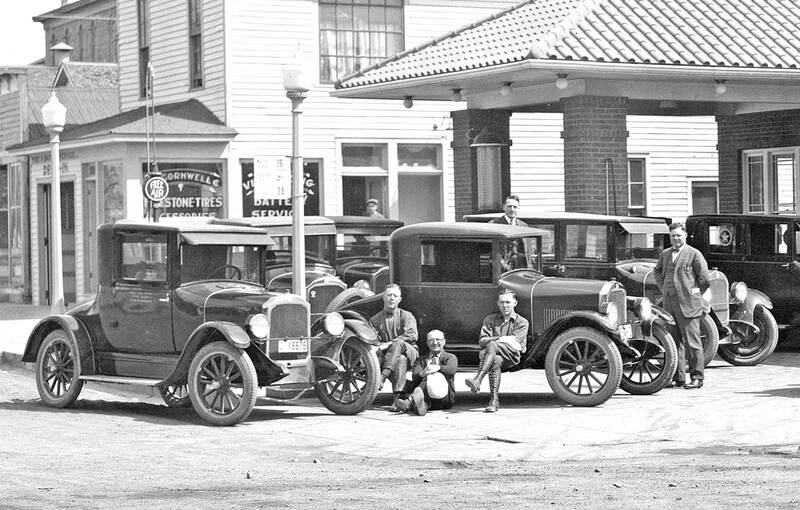 The Star was an assembled vehicle introduced by Durant in 1921 to compete with the Model “T” Ford; it was produced between 1922 to 1928. It was initially offered with a four-cylinder engine and six was added later in 1926. Learn more about William C. Durant here. Share with us what you find of interest in this photo courtesy of the University of Wyoming Collections. This entry was posted in Auto photos 1921 - 1942, Garages and Dealerships, Gasoline stations and tagged Durant Motors, Star Car, William C. Durant. It must have taken those fellows in the high boots hours to lace them up ! I found a vintage pair of those jack boots in a thrift store some (some? hmm, maybe lots) years back. The upper eyelets are the kind you loop around rather than thru, so putting them on isn’t all that arduous. Wish I still had them but they eventually disintegrated . Those and one of those Isotta Fraschini turtlenecks featured here a while back. I remember wearing boots like that when I was in the sixth grade or so. They were hand-me-downs from my dad. You just loosened the laces. That guy leaning on the lamppost suggests Sinclair Lewis’ George Babbitt, but of course Zenith was much larger than Rawlins. At 6th Street and Buffalo in current day Rawlins, nothing identifiable remains…not even the distant church steeple. Notice the pickup and panel truck have snazzy whitewalls, whereas the cars to the left (demonstrators, dealer stock, customer cars?) don’t. I’ve been through Rawlins (for years I thought the name was Rawlings), and the nearest big city is Denver. Interestingly, I’m currently reading the recent biography of U.S. Grant, and Rawlins was an attorney who became his chief of staff. Dandy article! I’m in the process of a 110% , end of assembly line, restoration of a 1924 Star “C” Touring. Don, about ten years ago, a friend of mine in Tiburon, CA asked me to inspect a 1924 Star two-door sedan (brougham?) here in Ohio that he was considering buying. It was a dandy; pea green, black fenders and top. He bought that Star, and had it shipped to San Francisco. Until he died a couple years ago, he puttered-around Tiburon, becoming a regular figure. That is some pickup with bumpers, whitewalls, and disc wheels with painted stars. Makes the other vehicles look quite plain. Terrific photo, lots to look at. Thanks. Great photo, obviously made by a professional with a large-negative camera, so it can be enlarged to show all of these details. Today someone would snap it with an iPhone and call it good, but back in those days photographers took great care with composition and lighting. The image was probably made with a 12X20″ “Banquet” camera. The negative was 12X20 and a 1:1 contact print has astonishing detail. They turn up on Ebay from time to time and film is made once a year by Ilford in the UK. Meyers Photo was proud enough to put his name on it. Definitely not done with the family Kodak. Durant was quite a personality, building up a wagon company to global prominence, then parlaying that into starting up GM, getting out of that relationship and then back in again, out once more and starting up Durant Motors aiming to replace GM as the biggest, out again, bankrupted by the Great Stock Market Crash and finally ending up managing a bowling alley and flipping burgers! But he did so much for the auto industry and Star was one of his attempts to provide low cost autos to the public that were more modern than the T.
As for the pix here, the great thing about large format monochrome photos is they will probably still be with us into the next century as they don’t fade like color photos do and most of the iPhone stuff will fade into digital purgatory IMHO. We even see brilliant photos made from glass plate positives from the Civil War era. As for the boots, they seem to be de riguer in those times and were part and parcel of any reputable (sic) motorcyclists’ outfit. Whitewall tires were not generally considered a dress up option quite this early. The natural rubber used in early tires was very nearly white. Some companies colored tires in various shades of red, green, gray, and occasionally other colors. The tires were quite soft, prone to punctures and blowouts. In the early days of the war in Europe, world wide rubber shortages created a need to find ways to make more tires out of less rubber. It was then, that it was found (somewhat by accident) that adding a form of carbon black not only made more tires out of a given amount of rubber, it made the tires much stronger, last longer, and less prone to catastrophic failure. For many years, early ’10s well into the mid ’20s, cheaper tires continued to be made with off-white casings, covered by carbon blacked outer treads. It is often very difficult to see this in original era photos, because the roads were dirty, and people almost never washed the tires. However, those off-white casings look to us today like whitewalls. White-wall tires didn’t start becoming a dress-up item until about the time this photo was taken. At that time, many people still looked at white sidewalls like the cheaper tires they had been for more than ten years. In the mid to later ’20s, designers decided they liked the way white sidewalls set off the wheels and tires. Roads were also getting better, tires didn’t get quite as dirty (at least not in town where more and more people were living). They began putting white-walls in their advertising, and sometimes playing up how nicely the white-walls set off the wheels and fenders. This went well with the brighter colors that were also becoming more popular in those years. When this photo was taken? Those white sidewall tires on the trucks were still probably thought of as the cheaper tires, not the snazzy choice. But if the tires were naturally white (or a lighter color) with just black added to the tread would there be such a clear (and uniform) demarcation line like we see here? I wouldn’t think so, but I doubt if there are any surviving tires out there to give us a definitive answer. The initial description says the photo is dated 1925, so I believe that was well within the whitewall-era. Also, recall these are demonstrator/ sales/PR vehicles. It stands to reason these would more likely be fitted with flashy tires than your average car or pickup. I agree with your historical remarks, you do see pure white tires on some pre-1910 horseless carriages, but not white walls as we know them. Of course on restorations, you see all sorts of historically questionable items. whitewall tire provided a black surface that met the road and could be returned to its original color after cleaning. I agree the tires on the truck were more likely the off-white casings with the black tread for a few reasons. First, the front right wheel also has a white sidewall on the inside; how many people using accessory whitewalls put them on both sides of the tire? Second, the join looks too flush, as if they are moulded that way rather than one applied separately over the other. Also the tire on the front right of the panel truck next to it appears similar in size width and tread pattern and looks to also be made of two shades of light and dark rubber, although in this case a bit dustier so the difference is less marked. From what I have seen of original period photos of the upmarket cars of the late ’20s whitewalls started to become popular around ’27 or ’28 which is why the over-restored trailer queens with ‘wide whites’ we see at shows now from before that time always look wrong to me (and then don’t get me on to shiny plated wire wheels on ’20s cars either). Star was still burning brightly, would even more so for one more year, then flame out. Dealers who took on Star and Durant would soon be looking for other makes as Billy’s empire crumbled even before the Depression began. Interest to see the NO SMOKING on the first photo. You wound not think a thing about it in todays world BUT back then. Guessing a lot of guys laughed at it. Hi David, thanks for another great series of pictures. In the second picture, on the right is a post with something attached or hanging on it. Any idea what it is or used for? In the first picture you can see the loop up above. Either way (or another?) what a great photo! There is an air stand on both sides of the station. The one on the left says free air. The two counterbalanced weights on the pivots kept the hose off the ground. The base of the air stand has a removable cover so the underground plumbing could be connected inside the base. Very similar to an “Air-Scale” Model I tire inflator. The Item in the center of the third picture is probably a water hose. The solid part on top of the post will bend and let it move around. Mad Dog – to save great pictures like these they are being digitized to be stored in that digital purgatory. IPhone pictures cant fade, they’re just numbers. 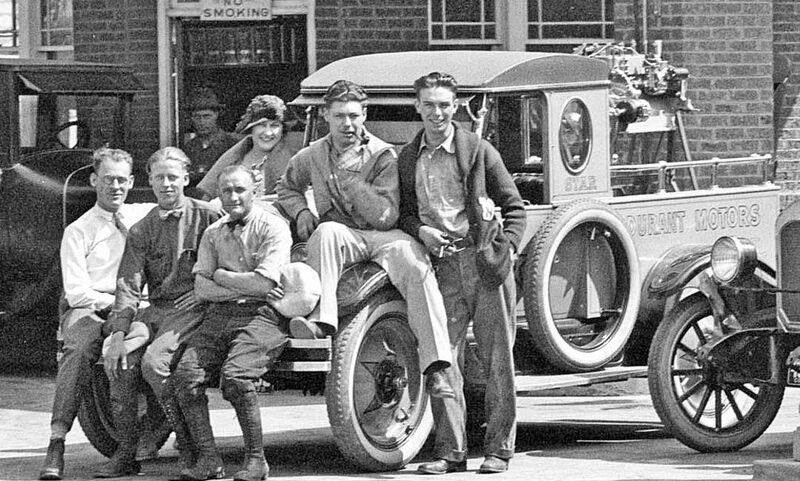 I have a 1930 model A panel truck so love the big panel truck in the one picture. The Star was sold in Australia, but as there was an English car of the same name that was also being sold, the Star was renamed as the Rugby in Australia. If you go to Facebook and search “Peoria Historical Society star car” there is a picture of the same truck in front of Waugh Bros Motor Co. Star/Durant must have been on a tour of the country with their new cars.